Complete Specs of AMD’s Next Generation 28nm based HD7000 “Southern Island” Graphic Cards have been revealed. The Specs detail the upcoming HD7900/HD7800/HD7700 Series graphic chips which would feature the new GCN (Graphics Core Next) Architecture from AMD. AMD’s fastest single chip card HD7970 (Tahiti XT) has already been reviewed, While its not a technological marvel over its predecessor it offers quite some punch over the Nvidia GTX580 GPU. 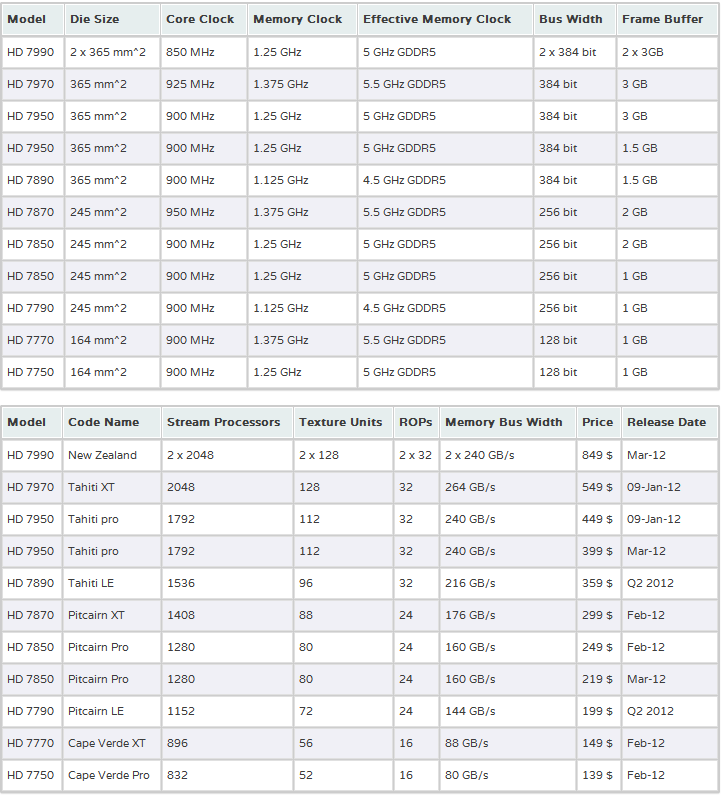 The second GPU in the HD7900 Series “HD7950” (Tahiti Pro) would be avilable in two different variants, One would feature a 3GB memory buffer priced at $449 and a 1.5GB model available for $399, The HD7970 would be available as a 3GB model priced at $549. 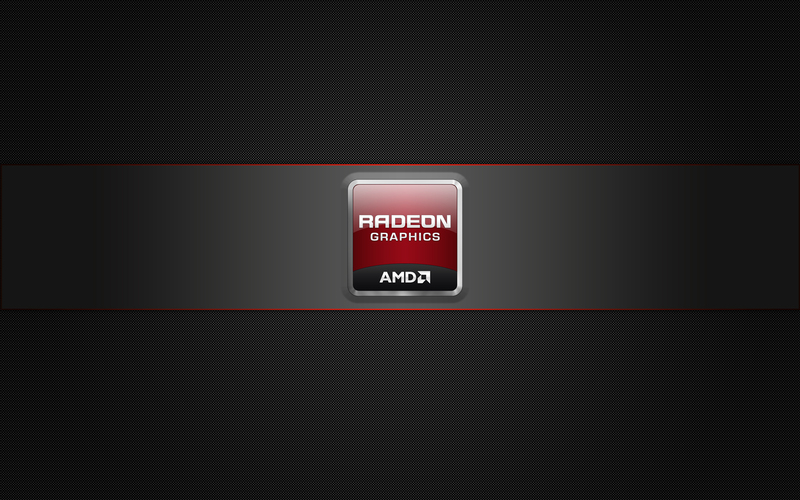 Both cards would launch on 9th January 2012 while the 1.5GB “HD7950 would launch in Q2 2012. The Dual Chip Flagship HD7990 (New Zealand) would launch in March 2012. The GPU would pack two Tahiti XT Cores featuring a total of 4096 Stream Processors, Core Clocked at 850Mhz. A 6GB GDDR5 memory would run across a 384-bit x2 wide interface . The Memory clock would be maintained at 5Ghz. The card would be priced at a hefty $849. Next up would be the HD7800 Series which are also based on the 28nm GCN Core Architecture. The lineup would include three GPU’s, First up would be the Pitcairn XT “HD7870” which would feature 1408 Stream Processors clocked at 950Mhz, A 2GB Memory across a 256-bit interface. The card would be priced at $299. The Pitcairn Pro based HD7850 would be available in two different models, Both would feature 1280 Stream Processors clocked at 900Mhz, The 2GB variant would be priced at $249 and the 1GB variant would be available for $219. Release is expected in February 2012. In Q2 2012, HD7800 Series would see the addition of another GPU known as the HD7890 “Tahiti LE”. The GPU would feature the Tahiti Die instead of the Pitcairn and pack 1536 Stream Processors, 96 Texture Units, 32 ROPs. A 1.5GB memory buffer with 384-bit wide interface. The GPU would be priced at $359 at launch. February would also see the launch of the Mid-End cards aka HD7700 Series which are also the lowest end card based on the new 28nm GCN Core. All other cards below the HD7700 Series would be re brands of the HD6000 Series. The Cape Verde XT/Pro based cards would include HD7770/HD7750 featuring 896/832 Stream Processors respectively. Memory would feature a 1GB buffer across a 128-bit wide interface. The HD7770 would be available for $149 and HD7750 for $139.